Wednesday I told you about Tie One On Day™. 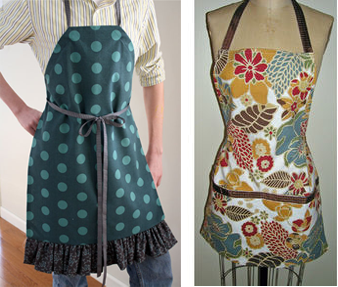 Today I’m going to share some of my favorite aprons from around the web. If you’ve been reading WeAllSew and/or Through the Needle magazine for a while, you won’t be surprised to see that most of my selections are easy to sew (i.e. quick to make). They make thoughtful gifts, especially when paired with homemade baked goods (as for Tie One On Day™) or cooking supplies. But don’t relegate them to the kitchen; they’re also super for crafting, gardening, and other endeavors. For maximum speed, start with pre-made linens. 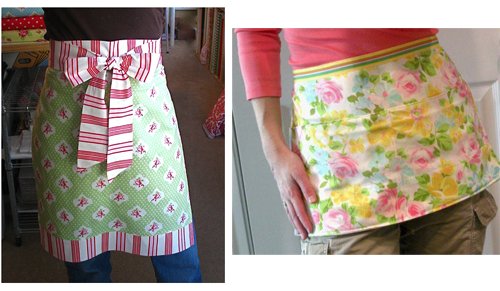 This chef’s apron from Skip to My Lou is made from a kitchen towel, some ribbon, and a bit of coordinating fabric. Leave off the ruffle and it’ll work for the guys as well as the gals. Mary Ray’s chic apron for Craft Stylish is made from two dinner napkins and a bit of ribbon. Big pockets are a bonus. Do you have some too-out-of-style-to-ever-wear-again blue jeans hiding in the back of your closet? Suzanne from Crazy about Collars turns the legs of one pair of “mommy” jeans into two rugged bib aprons with the addition of wide double-fold bias binding. Susan at Sugar Beans adds self-fabric ruffle and shirt-cuff pocket for a new take on the usual apron-from-a-man’s shirt style. Art Threads’ Deborah Schlegel designed this pinafore apron – including the front pocket – for just one yard of fabric by placing the center front fold on the bias. Clever, right? The beautifully stitched details on this Pin-tucked Mother’s Day Apron from Delia Creates aren’t just pretty; they also give this garment its trim fit. 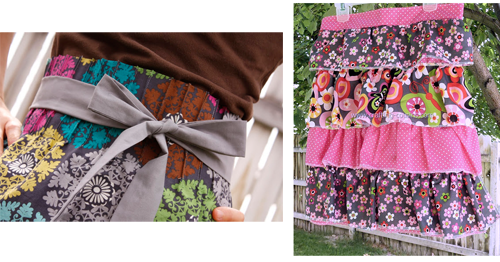 The Crafty Cousins’ Ruffle Apron features tiers of gathered ruffles stitched quickly and efficiently with an overlocker/serger; a rolled-hem provides a clean edge finish, and the serger’s differential feed is adjusted to gather the top edge. Don’t worry if you don’t have a serger; you can use a regular sewing machine for this project, too. 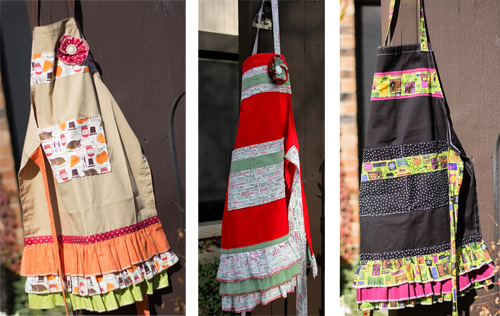 Amy Anderson at Crafts Re-Designed has made dozens of aprons. 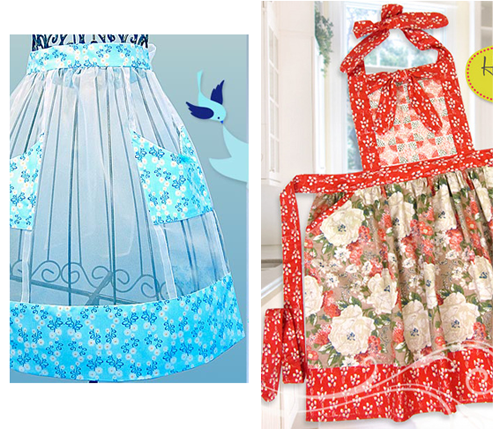 My favorite is this full-front ruffled apron with big pockets; I especially like the Christmas red, white, and green variation. Look closely and you’ll see that the edges of all the ruffles – along with the outer edges of the flowers – are finished with an overlocker/serger, too. BONUS: I just couldn’t resist adding these last two patterns. They’re so adorable! These Super-Easy Aprons for Kids from Scattered Thoughts of a Crafty Mom are a great gift for your favorite chef-in-training. My last selection is also the smallest. 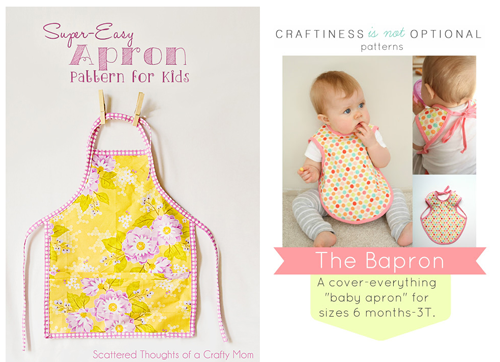 I’m not sure if The Bapron is a bib that looks like an apron, or an apron shrunk down to baby size. Either way, it’s a super idea from Jess at Craftiness is Not Optional. 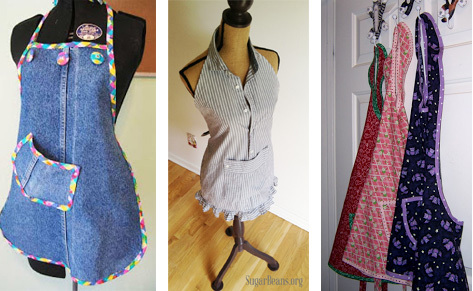 For even more apron ideas, be sure to check out Erika’s Log Cabin Patchwork Café Apron, posted yesterday, as well as our previous Tie One On Day posts from 2012 and 2011. Next Next post: WeAllSew Celebrates Our Loyal Fans: 64,000 Likes!